What was supposed to be a nice outing with the boys today turned out to be a visit to the urgent care center for Caleb...all because he decided it would be a good idea to jump from one end of the couch to the other...never mind that the "other" end of the couch was practically bare wood that had long ago lost its padding...The worst part? 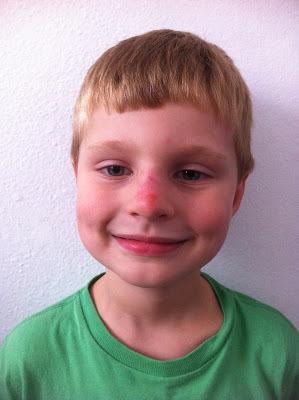 He dove head first...or shall we say, NOSE first? At least nothing broke in his nose or face...just a bad hit to the nose...and it was a relatively quick visit to the historically significant/architecturally attractive hospital!